Ever struggled to find that perfect gift for a loved one? Maybe there's a special occasion coming up and you want to organise a giftlist. Gifts & Lists is the perfect place to create your list and then use our custom-built tools to add gifts from any site on the web. Tell your friends and family and they can reserve items direct from your list. We've made it really easy to get up and running as quickly as possible. Just click on the button below to begin creating your wish lists. How do I use Gifts & Lists? Struggling for ideas to add to your Christmas list this year? Maybe you need to pick a fantastic or quirky gift for the person who has everything? Maybe you just want to know who the must-have item is this year? View our findings from Unwrapped here. Harry Potter, The Complete Collection - Limited, Numbered Edition! 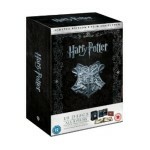 On December 2nd a limited, numbered edition of the complete Harry Potter film series will be released in the UK as a combined DVD/Blu-ray box set. This will include a whopping 19 discs with 3 set aside for bonus material. Amazon UK have the first 1,000 numbered editions and (for our US members) although it is not currently available in the US, copies can be ordered from the UK site. For the ultimate Christmas gift idea for any Harry Potter fan check out all the details here. With Gifts & Lists you have the ability to create gift and wish lists for a wide range of occasions. Whether you need a registry for your Wedding, Baby Shower, Anniversary or Birthday you can create all of these and many more on Gifts & Lists. 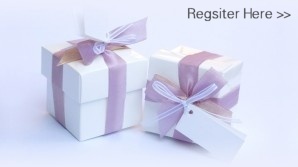 Gifts & Lists is perfect for creating Wedding Registries and Bridal Showers. You have all the functionality of a store-owned gift registry but with the added benefit of being able to add gifts from any website. It’s incredibly easy to create lists, add gifts and inform your friends and family. With the tools we've created you can browse the web, click on any item you like the look of and add it immediately to your Wedding Registry or Bridal Shower. The Bride & Groom can be as inventive as they like: From a new toaster to skiing lessons! If you can find it on the internet you can add it as a gift on Gifts & Lists. For that matter, you don't have to be restricted to the web - you can add anything from your home town and people just reserve it and buy it like any other gift. If your friends and relatives have signed up to Gifts & Lists they can be informed immediately and automatically that you’ve added new gifts to your registry. If you’d rather keep this information private for the time being you just make the list private. (Don’t worry; you can change the status at any time). As the day approaches, planning for a new baby can be a daunting experience – especially if it’s your first! You move from shop to shop attempting to work out what are the essentials and getting completely baffled by the array of items on offer. Although staff are often helpful the shear amount of items makes it difficult to prioritise and remember at a later date. That’s where Gifts & Lists Online Baby Registry comes in. As you discover items your baby is going to need you can simply add them to your gift list no matter which site they originate. You can compare prices and move or delete gifts as desired. When friends and family ask if they can get the baby a gift you can point them at your gift registry – we’ll even help you create the email. They can then buy from the vendor online or reserve the gift off your gift list and pick it up from the store. This way you know that the gifts from your Baby Shower are going to be what you and your baby really need! You can also use Gifts & Lists as a checklist for yourself: Add all the items you need to purchase, where’s best to buy them from and tick them off your list as you pick them up. You can even save your baby gift registry as a PDF and them email it or print it to take with you. Why not use Gifts & Lists as a source of ideas: Let people who've been through this before help you create your baby registry by looking at theirs. Chances are they've already done the research and know what the best items are and where is a good place to find them. Everyone looks forward to Christmas. The vast majority of us also dread picking out gifts for friends and relatives! There’s nearly always at least one person who is particularly difficult to choose for. Then there’s the confusion with people searching for sly hints on what you might like. This situation was actually the inspiration for Gifts & Lists - coming from a large family the problem only gets worse! With Gifts & Lists you can set up an Online Christmas List months in advance (Or, for those not so organised, the beginning of December – come on you’ve got to give your sister at least a sporting chance to get that must-have item before the sales run out!) Whenever you spot an interesting item you just add it to your Christmas List with a couple of clicks! Before you know it your list has grown full of great gifts without you even thinking about it! Anniversaries are another great opportunity for using Gifts & Lists. Whether it be a working milestone or significant Wedding Anniversary, Gifts & Lists not only provides you with all the tools required to choose a special item but for those who may want to provide a surprise gift we have a selection of items we’ve chosen and placed in Our Lists. Here you can select an example 1st, 2nd, 3rd Anniversary List or whatever the occasion is and we will have filled it with gifts suitable for that particular event. You can then select the item to store on your own personal list or click on the item to visit the vendor’s website. Like Christmas Lists, Gifts & Lists is the perfect place to store items you’d like to receive for your Birthday. Birthday Lists can be constructed in advance and gifts added whenever you happen to be surfing the web and find something you like. Just right-click on the item and add it to your online Birthday Gift List. How many times have you been surfing the internet when you come across a DVD or Album you like and think 'I must get that' only to forget about it and not tell anyone. Now you can add it to one central gift registry and come back to it any time you like, together with links, comments and how much you wanted it. It makes life so much easier for you and your family and you'll be amazed at how quickly your collection builds!